See ya later, Hong Kong! A and I are about to leave Hong Kong for good in a couple days, embarking on a new journey to Beijing and Lijiang before we will return to Oslo. But here are my final thoughts on what can only be described as the greatest 5 months of my life so far (minus the part about not having my husband with me, naturally!). When going to a new, unfamiliar place, everyone has one not so simple choice to make. Either ignore whatever makes this place different and life in your comfort zone or embrace it with everything you have, even if that means you will feel like a fish out of water. And a fish out of water I was (after all this blog is called a bird loves a fish…). Making that choice was easy, probably because I’v made that choice so many times already, that it comes natural to me. I wanted to understand the Chinese ways, I wanted to understand the relationship with food, the relationship with nature and mostly the relationship with one another. In some cultures, it is a bit easier to relate for instance to the relationship that people have with food. In Italy, for instance, you will not have any problems with sitting down with the locals eating whatever they’re eating. Chances are, it is better than anything you ever had where you are living, especially compared to what your home calls ‘Italian’ food. But if being in Hong Kong has taught me many things. One of them is, that apparently anything is edible even if it shouldn’t be and that going out of your comfort zone, is the best possible way to embrace the culture. I learnt about how to not care if anyone is listening in on your conversation on your phone and the louder you speak, the more people will be part of your conversation. I learnt that it’s totally cool playing a 90s video game on your smart phone with loud music on public transportation without any hesitation. I also learnt that walking whit your eyes glued to your smartphone screen is a thing and that people will not pay attention to you, not even when you elbow them in their chests (yes, also learnt that from experience, although I will not tell you how that came about, because it might make me seem like a vicious person, which I am not. Let’s just say I get easily irritated, when people don’t pay attention). I learnt to hike high mountains by walking up endless flights of stairs and I learnt that sweat can feel like a second skin, which most of the year it is, to locals anyways. I learnt how to haggle and how to tune down my gag reflex, when smelling things, that no one ever should be smelling (I’ll spare you details of this…). I will let you in on one last secret before I leave Hong Kong for good: Hong Kong beyond everything has exceeded my expectations. Hong Kong will forever have a very special place in my heart. And having to leave Hong Kong will be difficult but I am thankful for all the memories I made and all the stories I have to tell. 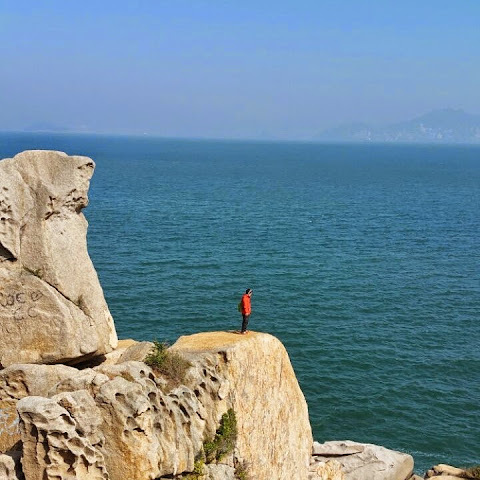 Like this one for instance, this crazy guy on Cheung Chau thought it would be a great idea to climb up this rock, just so he could feel like he conquered the world and quite honestly, just like he did, Hong Kong conquered me.